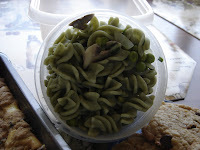 Last night we cooked the fresh spinach pasta we received in the CSA box. Tasty!!! We sauteed the criminis with some onions and then added them, some peas, chives, and butter to the pasta and dolloped bits of the chevre on top. 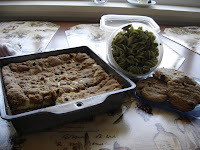 Very tasty meal. 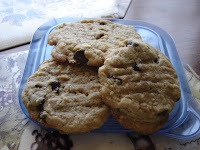 After dinner, SP made peanut butter chocolate chip cookies for himself (I don't like peanut butter - what a waste of yummy chocolate chips) and chocolate chip cheese bars for me. 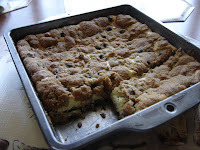 The chocolate chip cheese bars are so simple and tasty - just buy a log of Pillsbury chocolate chip cookie dough, press half into an 8x8 pan; mix together 8 oz cream cheese, 1/2 cup sugar, & 1 egg; spread on top of dough in pan; crumble remaining dough on top of cream cheese mixture; bake at 350 for 35-40 minutes.